Mendaña y Neyra and is named San Bernardo. Fernandes de Queirós and named Peregrina. the name is later applied to the whole group. 29 Mar 1777 Mangaia sighted by British Capt. James Cook. British Capt. James Cook and recorded as Wautieu. Endeavour, later it is called Walker's Island. proclamation of 4 Apr 1891). 5 Jun 1891 Cook Islands Federation. 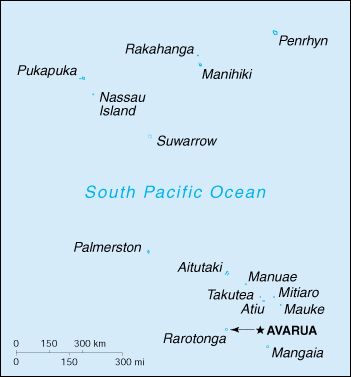 15 Mar 1893 - 11 Jun 1901 Part of the British Western Pacific Territories. 6 Sep 1900 Cook Islands petition to be annexed to the U.K.
8 Oct 1900 Cook Islands ceded to and annexed by U.K.
(by order in council of 13 May 1901). for the Cook Islands made responsible. (reorganized as Legislative Assembly 1 Sep 1958). Executive Committee for the Cook Islands created. association with New Zealand)(Cook Islands). 1974, the Minister of Foreign Affairs). determined (ratified 8 Sep 1983). ¹The style of the ruler: "By the Grace of God, Queen of New Zealand and Her other Realms and Territories, Head of the Commonwealth, Defender of the Faith."